Fotografiska is a new international platform for photography, located in the heart of Stockholm. The museum has an exhibition space of 2,500 square metres, and features four major exhibitions per year along with 15-20 smaller exhibitions. Fotografiska aims to engage and inspire a dialogue on photography via exhibitions, seminars and courses, in addition to actively working toward the acquisition of contemporary photography for their permanent collection.Fotografiska is housed in a former Art Nouveau style industrial building dating from 1906. Designed by famous Swedish architect Ferdinand Boberg, the building was used for the customs control of goods, and is listed as a building of cultural interest. The original brick facade of the beautiful customs building is intact, while the interiors have been renovated to house the museum. All the material and colours have been selected in keeping with the ambience agreed upon for the Museum, with the criteria that they harmonise with exhibits of both black and white, and colour photographs. 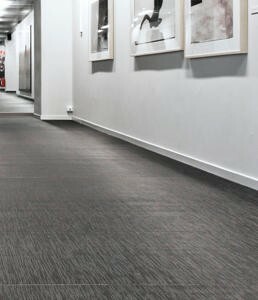 The flooring was developed using a particular vinyl Bolon texture: its unique design produces discreet patterns that cannot be created using any other manufacturing method or any other material.